COSTUME INCLUDES NECKLACE, HOODED MINI CAPE, DRESS AND GLOVELETTES WITH CORSAGES. COSTUME INCLUDES BLACK HOODED VELVET ROBE WITH METALLIC TRIM. NIGHT WIDOW COSTUME INCLUDES VELVET BRA TOP, VINYL NECKPIECE, WEB OVERLACE SHIRT, VINYL BELT & VELVET SKIRT. 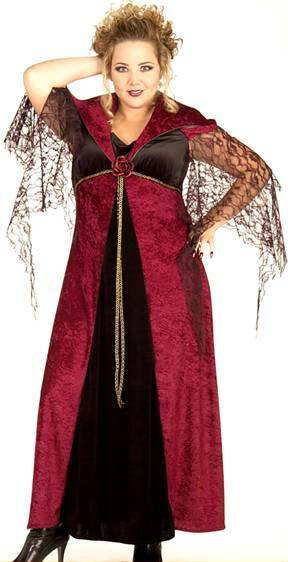 Vampire Costume for Full Figured Women.